Artists, Songwriters, Producers. Check This Out. Plus: a free focus group on your music. Click here to open a free account. Upload your music (or import it from other sites) and watch the magic happen. Music Xray is the online platform where over 1300 industry professionals conduct A&R (seek new songs and talent). When you open a free account and upload your music, we automatically alert you when an industry professional is seeking music like yours for a specific opportunity and then we enable you to get directly in contact with the professionals, submit your music, interact and make valuable connections. We GUARANTEE they listen and we GUARANTEE you will get a response directly from them the very moment they hear your music. Some of the professionals on the site include major labels such as Mercury and Geffen (Universal), Columbia and Epic (Sony), Sire (Warner), Parlophone and Capitol (EMI) as well as Hollywood music supervisors from Universal Pictures and major advertisers, video game developers, radio stations, publishers, hundreds of independent labels, Bravo, Discovery, History Channel and it's even where major television network shows like NBC's The Voice take in audition demos. Since February of this year, over 3500 songs and acts have been selected for opportunities via Music Xray. These include major and indie label signings, songs placed in major motion pictures including the main theme in the just-released Justin Timberlake's Friends With Benefits. Some of the success stories can be read here. The U47 was used to record the vocals on Amy Winehouse' "Frank" and "Back To Black" albums for the songs which were produced by Salaam Remi. The Neumann U47 Microphone is a vintage mic (1947) that's held in high regards by many and is definitely a collectors item. It is one of the most cloned mics in history and usually sells for as much as $10k and more on the used market (ebay). The mic comes with a proprietary power supply and cable. 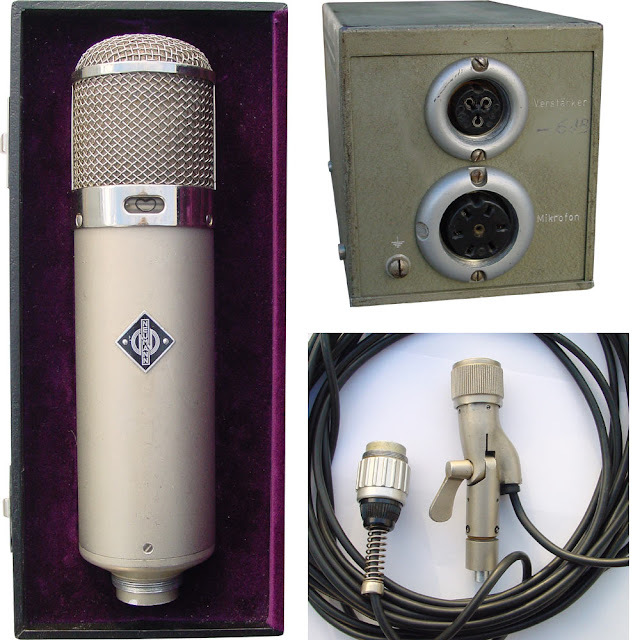 It was distributed by Telefunken for a short while but then Neumann took over. There are two types of U47's, tube and FET(which stands for Field Effect Transistor). The FET's (1965) were made because the original tubes were no longer available. They are both excellent microphones but different in their sonic texture. The tube U47 sounds amazing on vocals and sax. The FET U47($2000) sounds good on upright bass and kick drum (yes, kick drum). The FET 47 can also be used on vocals but I prefer the tube model. The U47 has two polar patterns, cardiod and omni-directional. Due to the design the cardiode pickup pattern provides approximately 5db hotter output. (There was also a U48 that had the figure eight pattern but I’ve never actually used one). The frequency response for both omni and cardiod are the same, 35Hz to 15KHz with a slight bump in the upper mids. There were only about 5000 U47s made. Here's a link to a Mix Magazine article giving more detailed info on the U47. The article was written by the late Stephen Paul who was world renown for his microphone modifications. The world recently lost a talented young lady whose music touched millions. But for me she was more than just one of my favorite artists she was a friend. Amy was so much more than the media's portayal of her. For instance I remember when we were in St. Lucia she would feed the stray animals on the beach everyday. Once we were having brunch at the seaside restaurant where we ate daily and she excused herself from the table saying she would be right back. She soon returned with about fifty local kids, some shirtless and instructed the waitresses to give them whatever they liked and put it on her tab. Another friend of mine (Nicole) who I met while working with Amy sent me this message on Facebook. It sums up quite well how the people who knew her feel about her. "We will always remember her for the person she was when we knew her. Alive, vibrant, wacky, irrational, spirited, gifted, rule breaker, quiet, loud, animal savour....but most of all a child's heart that gave love & wanted desperately to be loved in return.......Amy you touched all who knew you well. Rest in peace. The little girl with a big heart & even bigger voice. Hugs to you all x x"
Amy I'm glad I was able to know you even for a short time. When we first met you were only 19 and you won me over with your amazing voice. Then as I got to know you as a person you became my friend. Wish you were still here. I miss your generous spirit, your laughter and your wry humor. My deepest condolences to all of Amy's family, friends and fans.